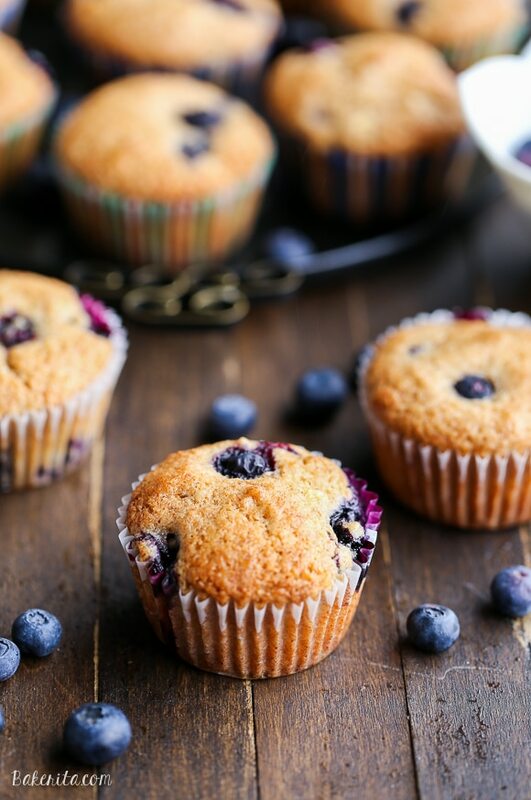 You would never know these Vegan Blueberry Muffins were made without eggs due to their light texture and incredible flavor! This easy recipe comes together quickly and only uses one bowl. B) I had never shared my favorite blueberry muffins on here! So naturally, I just started whipping up the recipe. I ran to grab an egg, and…no eggs. I’m not one for egg replacements, so I had none of that either. I spotted a banana, mashed it up and threw it in. I went to grab the milk, and realized it was heavy cream or almond milk. Erring on the side of health, I grabbed the almond milk. I used half whole wheat flour to help them be a bit more nutritious, and after mixing up all the batter, I realized they were vegan! I usually add a crumb topping to these muffins, and I promise to post the original recipe soon, but I decided to forgo it and hope these turned out decent. Well, guys…they turned out WAY better than decent. No one even realized they were vegan OR whole wheat, they tasted so perfectly light with the exact texture of sort-of dense, but soft-of fluffy that I always want in a muffin. I wouldn’t say they’re healthy, but they’re not as bad as the white flour, crumb-topped ones for sure. Oh, and that banana? You can’t taste it, I promise. It just gives the right amount of moisture that the lack of egg took away. If you like to add spices to your blueberry muffins, I love a 1/2 teaspoon cinnamon and 1/4 teaspoon nutmeg in this recipe, but add whatever and however much you like! I left spices out of this batch to let the blueberries shine. Also, if you use frozen blueberries, be aware your batter might turn a little blue! Be super careful not to overmix those babies. Preheat oven to 400ºF. Grease 12 muffin cups or line with muffin liners. Combine the all purpose flour, whole wheat flour, brown sugar, white sugar, salt and baking powder. Add in milk of choice, mashed banana, and oil and stir until just moistened. Fold in blueberries. Divide the batter between the 12 muffin cups, they should be about 3/4 full. If you don't want any banana flavor, use unsweetened applesauce instead. These look so beautiful Rachel! 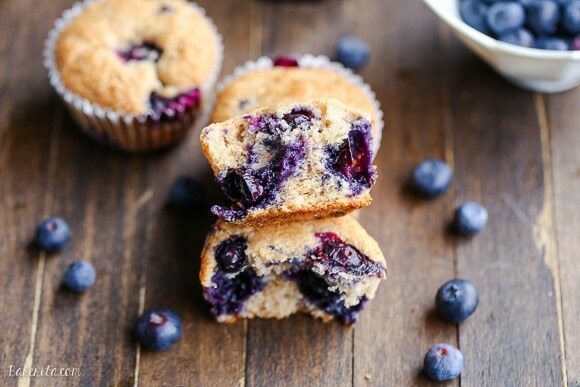 I have a bunch of about to go bad blueberries that are just calling to be made into muffins like these! The muffins look very good, but way to much sugar in them. I made these today with 1/8 tsp SweetLeaf Organic Stevia Extract (powder).Contains no maltodextrin or even silica, in case you’re concerned ( I was. )Anyhow, they came out great and sugar free. I also subbed all white whole wheat flour. Rather than measure out a cup, I just dumped a whole pint of blueberries in. I’m sure it was close anyway. Wow – I never really try eliminating sugar completely, but this is awesome to know. I think I’m going to try it this way soon, I’m intrigued! Thanks for sharing the knowledge Eric! Omg, just tasted the first one…. my boys and I are in blueberry heaven. Thanks for the recipe! Ps. I also used coconut oil. So glad you and your boys are loving the recipe, Tracy! Great to know they work with xylitol :) thanks so much for leaving your feedback! We just made this recipe-Delicious!! I used only 1/4 cup of sugar because I used soy milk which already comes a little bit sweet. Next time I will only bake them a little less. They came out just a tid bit dry but the flavor is heavenly. Thanks. Hi Val. How much soy milk did you use? And for how long did you bake them. This recipe sounds great but they do look a little dry in the picture. Thanks in advance. Your muffins look totally delicious! These sound delicious. I’m becoming a big fan of vegan baking, especially when I suddenly discover that I’m out of eggs or butter! I’ll have to keep this recipe handy for one of those occasions! Good job on veganizing these babies! Not always easy to do but they look wonderful! Happening in my kitchen ASAP. These look awesome! These look amazing, Rachel! Love that they’re whole wheat and that you added banana, too. Definitely saving these blueberry cuties to try soon! I’m in awe that these are vegan and whole wheat! These muffins look fluffy and moist (ugh I know awful word but still true) and just like the perfect blueberry muffins! 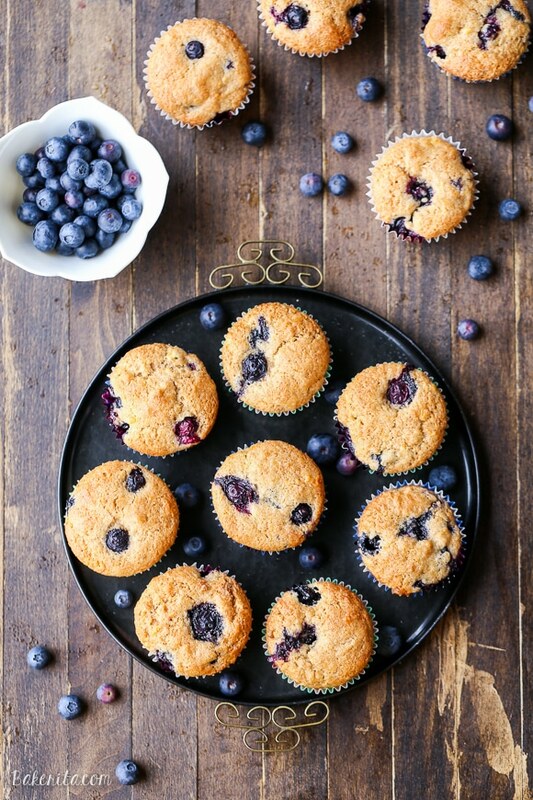 I love blueberry muffins, and adding banana in baked goods! I’ve never used it in place of eggs though–what a great idea! And these look delicious! I love that these were an accident : ) Sometimes the best recipes happen when you least expect it! And I love blueberry muffins – although I’ve never tried a vegan version. I need to give these a try! Recipe accidents that work out are the BEST! I love that these are accidentally vegan, also love your graphics and design too! I would have never thought about using a banana to replace the eggs in a recipe. But seeing how delicious these muffins are, its a great idea! Accidental baking is sometimes the best kind! I’ll be trying these out for sure! I love recipes like this! You are halfway through making them and then, crap, I’m out of three key ingredients. Then you make a few substitutions and they turn out amazing. It feels like such an accomplishment – and these muffins definitely look like an accomplishment! Yum. These are absolutely beautiful! Love those bright blueberries! So glad that you liked the muffins Aline! I have a new version that will be posted soon! I made these this afternoon.. and they were A-mazing! Next time I might try using coconut oil instead of vegetable oil to make them a little more nutritious but they were great nonetheless! I used brown rice flour and coconut palm sugar, I replaced the oil with Melt buttery spread, I used applesauce in place of the mashed banana. I made raspberry muffins, added a small squeeze of lemon juice and also added 1/2 cup 65 percent cocoa dark chocolate chips. Wowza! Amazing recipe, so delicious, thank you! These are fab and exactly what I was looking for! Thank you so much for reading my mind! We also mixed all of the wet ingredients together, including the sugar, and then folded into the dry ingredients. This recipe was fun and amazing! You should post it to http://www.allrecipes.com and share with the world! Thanks so much!! Thanks Rissa, so glad that you all liked the muffins! Thank you for this recipe Rachel! We are dairy & egg free, so we’re always looking for new recipes. My son’s mouth is watering now as we wait for them in the oven. And we didn’t change a thing on the recipe – yours look perfect! Happy baking! Awesome, can’t wait to hear what you think of them! :) Hope they turn out well. Phenomenal! Loved them, so good. On,y difference is a replaced the two flours with 1.5c of whole wheat pastry flour. I found this recipe and thought it looked good. We made the muffins last night and they are delicious! The last one disappeared this morning and I am planning on making another batch. Fantastic find – thanks for posting it. I may try to substitute applesauce for the vegetable oil to see if it can be low fat as well. I am SOooo glad I found this recipe. These muffins are amazing! I didn’t have a banana so I stole some of my daughter’s unsweetened applesauce. I want to eat every one of these muffins…Must. Walk away. From kitchen. So glad you liked the muffins, Alyssa! These muffins are amazing. We used wild blueberries, they are delicious! Made these for a second time today. A double batch with vanilla rice milk, a few more blueberries and banana than called for, brown sugar and turbinado sugar and a pinch of cinnamon. Baked two batches of 12 at 400 degrees for about 29 minutes each. Very, very good. My girls love them and so do I.
I recently reviewed the official website of a banana company which said that dark brown bananas are still perfectly good to eat, esp to bake with. (They can be frozen in the skin). I was very surprised by this and had always thrown them out. No more! Into muffins they go. I cook for my very picky 2 y/o old grandson who had always eaten everything we ever gave him (mostly homemade baby food-HEALTHY!). Now all he wants is peanut butter, bread and milk! But he loves cake so I will be adding pureed veggies to these muffins. Does affect the amount of other ingredients? esp liquids? Please add the nutritional info including the info for sugar grams and calories. Thanks. Can not wait to try these! I don’t add the nutritional info because so many people make changes to the recipe. If you’d like to know the info, there are a number of good recipe nutrition calculators online. As for the amount of other ingredients, adding pureed veggies would definitely affect the ratio of liquid to dry ingredients, but since I’m not sure how much you were planning on adding, I’m not sure how to adjust the recipe. You may want to reduce the amount of banana and replace it with the veggie puree. Be careful when freezing bananas in the skin. They can be VERY difficult to get the skin off later. I always peel them and just put them in a freezer container. Then they are ready to go with no mess. Yes, this is definitely the best way to freeze bananas! Thanks for sharing. These are amazing! A perfect treat to impress my my new boss who is the only vegan I know and have EVER cooked for. I substituted the bannana for applesauce, as I was fresh out of bannanas, and used almond milk, and they turned out beautifully; so soft, fluffy and tasty. To make them a bit naughtier I sprinkled the tops withs a mixture of brown sugar, cinnammon, nutmeg and oats. I live in Spain (from NY) and miss blueberries – when we have them they are between 3 and 4 Euros for a 125 gram basket – I totally lucked out today and found the most beautiful blueberries in Lidl for 1.69€!!!! So totally bought them out and came home sooooo happy!! I am also vegan and was sooo happy to find this recipe – they are in the oven right now!! thanks!!!!!!!!!!! Mmm, love these with coconut oil as well! Hope you liked them, Eden! I have made these muffins and everyone loved them. Followed the recipe except I added a tablespoon of flaxseeds w/ three tablespoons water as if i was replacing an egg. The second batch I made, I also added chopped fresh strawberries and they were totally delicious. Definitely recommend them. Thank you for sharing this wonderful recipe! Glad to hear they turned out so well with both changes!! One of my favorite things about these muffins in how versatile they are. Thanks for sharing, Marie! Hi! this recipe is one of my son’s favorite. He has multiple food allergies but fortunately he can eat all the ingredients in this yummy recipe. I have made them about 10 times already and they are always a hit with the entire family. I also add about 1/2 cup of strawberries, chopped very small and he totally loves it. Thank you so much for this wonderful recipe! I’m so glad that your son enjoys the recipe! So great to hear, and the addition of strawberries sounds absolutely delicious. I’ll have to try that! Thanks for stopping by, Maria. LOL! I made these VERY LATE last night and I doubled the recipe I thought that 1 1/3 cup of oil was a lot so I just added 1 cup and called it good! Was I surprised to see when I looked at the recipe this morning that I has already doubled in my head the oil, then doubled it again. You will be happy to know that even with my mistake these muffins came out wonderful! Made these for my vegan daughter. Wound up needing more soy milk than called for in the recipe, but otherwise very easy to prepare. They turned out brilliantly. They are delicious, light and gorgeous. I finished these with a little sparkling sugar, which made them even more beautiful. Thanks for this recipe. I’m so glad you and your daughter enjoyed them, Ross! Love the touch of sparkling sugar. Thanks for commenting! 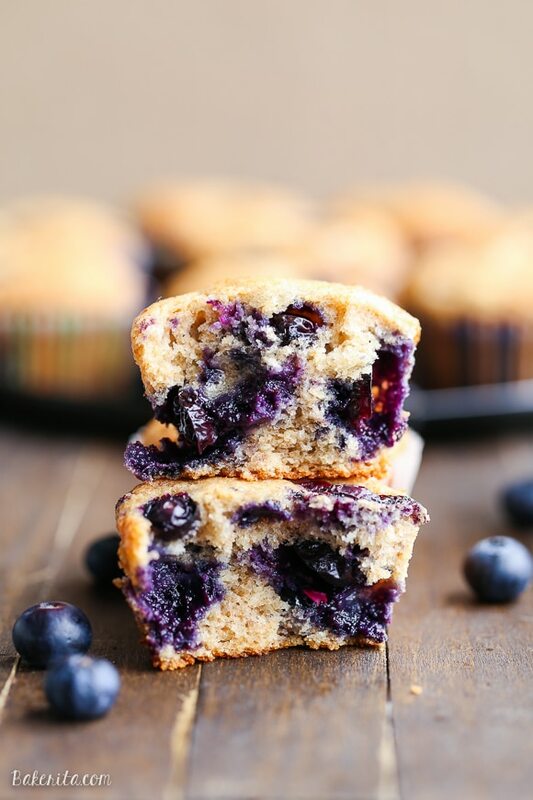 Blueberry muffins are my absolute favorite! 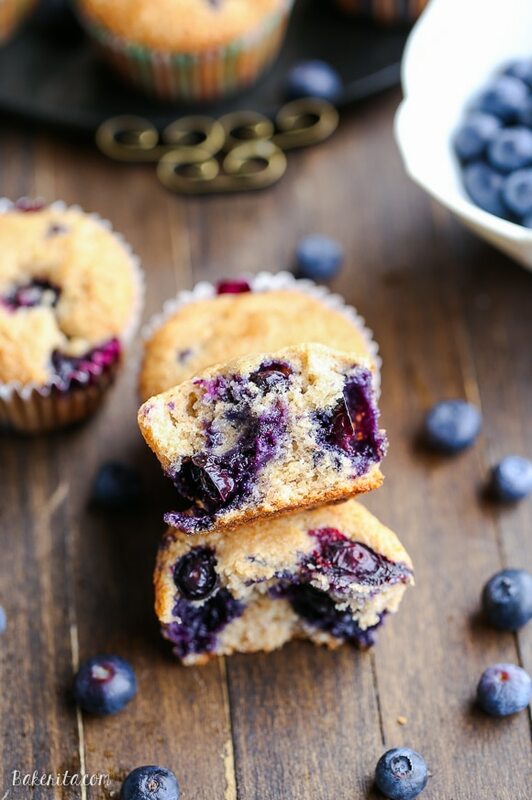 I’m totally craving these muffins on this Monday morning. I’ve never tried a vegan version before, so I love this twist. Sounds delicious! These muffins look amazing Rachel! And given all the incredible reviews I am definitely going to have to try them soon! For muffins without eggs these sure look fluffy, leaved and moist. Definitely a recipe I need to try. I am allergic to bananas. Could I substitute applesauce? Yes, definitely! Use 1/2 cup applesauce. Enjoy! I tried it once already and they were so perfectly worst, fluffy, and delicious. But this time I have no banana, Could I substitute a flax egg? Hi Erin, so glad you enjoyed the muffins. I haven’t tried it with a flax egg, but it might work – applesauce will work in place of the banana as well. Just whipped these up. My first ever vegan baking experience and I LOVE them! Can totally see myself making these every sunday to have during the week! Is it okay if I share this on a new blog I just started? Im very new to being a vegan and blogging! So glad you enjoyed them Tabitha!! If you didn’t change anything about the recipe, please just link back here for readers to get it. Thanks! Hi Rachel, these would be delicious with a bit of lemon zest added! This particular recipe doesn’t call for it, but it would definitely be a welcome addition and add a bit of brightness to the muffins. Hope you enjoy them! Just wanted to say thanks for this recipe! My son has egg allergies, and I wanted him to enjoy some muffin goodness with us. These were delicious, and I appreciate that I didn’t need any unusual ingredients to make them. So glad you and your family (especially your son!) enjoyed the muffins, Corrie! Yummy! 2nd time making it right now….I mix it up. Add different flours (organic corn meal is good! ), different oils (coconut), and stevia as others have mentioned. Thank you! Corn meal sounds delicious – must try that! Thanks for the feedback Lisa. So glad you’re enjoying the recipe! I made these as mini muffins, replacing the white sugar with pure stevia and adding some cinnamon and cardamom. They’re delicious! Amazingly delicious! Super moist! Followed almost exactly as written – used coconut oil instead of vegetable oil. Pinned! This will be a new go-to recipe for me!!! Thanks so much! I’m so happy to hear it! Thanks so much for your feedback, Elizabeth! I’ve made this a couple of times & they’re delicious! A perfect staple vegan muffin. Thanks for the tip, Haley! So glad you’re enjoying these muffins. My family and co workers loved these muffins. I made them with very few modifications. I used 1/2 cup brown sugar and 1/3 cup vanilla olive oil. So glad I found this recipe. So glad they were a hit! Thanks for your feedback Sheilah. My husband and I made these muffins last night and we were so happy. They are delicious! We were a bit concerned with the amount of sugar so we reduced it by 1/4 cup. We used Ripple milk and were pleased. They were also very quick and easy to make! This will be added to our weekly rotation. Thanks for the recipe. So thrilled to hear they were a hit, Yvette. Thanks for your feedback! I made 15 of these for a bake sale at a concert of my a Cappella group and they sold really well! I made mine with coconut oil (quite sparing with it, dare I say) and soy milk. I find that they taste much MUCH better served later than fresh out of the oven, after being stored in air-tight container at least over night, so that the muffins would moisten and soften up to a delicious bite. I also put a little bit of marmalade on them to give it some zesty kick and a glistening glaze. 2. Add extra plant milk and baking powder to the batter if you have refrigerated it overnight. For every muffin worth of left over batter, add 1/2 table spoon plant milk and 1/8 teaspoon of baking powder. Thank you for your recipe, it’s really amazing! So thrilled to hear they were a hit, Alex! Thanks so much for sharing all your tips and feedback. These are absolutely delicious! I used frozen blueberries and just gently folded them in at the end. The batter kept its color. I am eating one now warm out of the oven and they are perfect! Thank you for the recipe. So thrilled you’re enjoying them, Sharon! Thanks so much for your feedback. I made these this morning! I didn’t have whole wheat flour so I just used all purpose. I also added a half teaspoon of vanilla extract and a generous sprinkle of cinnamon. These muffins are amazing and I’m sad I can only have one a day (I’m on Weight Watchers)! Do you know if these beauties freeze well? I’d love to save some for another time. Thanks! So glad you’re enjoying them, Heather! They freeze very well so you can definitely freeze them – just make sure to store them in an airtight container or bag. I found this recipe because I was out of eggs. I also had two over-ripe bananas. It was perfect! They were delicious! Can i make it with frozen berries? Hi Baker, the color might bleed and they might add a little extra moisture, but it should be fine! So happy you’re loving them!! Thanks for the feedback Eunha. These were delicious! They are very moist and tasty. I used vanilla milk in the recipe and added a little cinnamon as suggested. Thank you for sharing this amazing recipe! I’ll be keeping this as a staple muffin recipe! So thrilled you’re enjoying it, Karsha! Thanks so much for your feedback. These were awesome! Thank you so much for sharing! So glad you enjoyed them, Lauren! thanks so much for the feedback. I tweaked this a bit by roughly halving the sugar but using light brown instead. I then used the 2 bowl approach 1 for dry and 1 for wet, adding in 2 tablespoons of apple sauce into the soya milk and oil in the wet bowl. I also added a pinch of bicarbonate of soda to the dry bowl and used half self raising and half spelt flour. They have turned out so fluffy and soft and incredibly light but without any after taste that sometimes comes with baking/bicarbonate. To be honest they have been one of my best results since going vegan so thank you for the basis of my experiment! So thrilled you’re enjoying them Shari, thanks so much for your feedback! Hi Dom, glad it worked with the date paste! I’m surprised it didn’t add too much moisture – thanks for sharing your feedback! These are really good – however you can completely taste the banana, and they’re more like a banana-blueberry muffin, therefore. I was looking for a classic vegan blueberry muffin, so these were a slight let down. Had to add more milk as they weren’t moist enough, and they took about 22-24 mins to cook, not 17-20. I would make them again if I wanted a banana/blueberry blend. Hi Tara, yes of course since they use a banana, a bit of the banana flavor will come through. You can use applesauce instead if you don’t like the flavor. This is one of the best recipes I’ve found but I’m struggling only with how moist these are! I have to use a GF flour and I’m following it to a T but some times they come out perfect and some times they come out so moist they fall apart coming out of the tin? I am using frozen berries but otherwise I don’t know – any help? Hi Caitlin, I’d bet it was the frozen berries – they hold onto water in the freezer that they wouldn’t when fresh, and then when baked, they release that water, adding a bunch of liquid to the muffins. I would thaw and drain them before adding to the recipe and see if that helps! These were good but next time I would not use coconut oil. Didn’t like the taste. Hi Gina, you can always use refined coconut oil for no coconut flavor! I used rice milk. My granddaughters are allergic to eggs and milk. Delicious. So easy to make. Thank you. So thrilled to hear you and your granddaughters enjoyed them, Lynn!